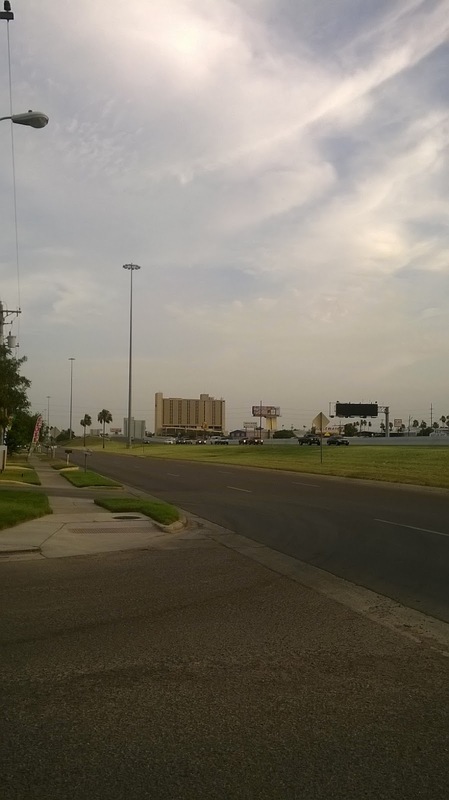 Writing for the Associated Press, Jill Colvin gave us a taste of what Laredoans thought about Donald Trump's visit to Laredo last week and his recent incendiary comments. While some natives disagreed with what Trump said, others were convinced that he spoke truthfully when it came to immigrants. Jessica Gonzalez was quoted as saying, "All we have is people from foreign countries. It's not like it used to be." Jessica is described as a retired housewife, 79 years of age. (Apparently the name Jessica was a popular baby name during the Great Depression.) Her lament is that too many Laredo restaurants have switched over to a Mexican menu. Enrique Harrington-Ramon's cane-waving took on the issue of language: "I am sick of walking into a store and hearing 'en que le puede ayudar?' What country are we in?" Interestingly enough, he said this outside OBREGON'S MEXICAN RESTAURANT. No report was made on what Mexican dish he took advantage of at Obregon's as immigrants purportedly took advantage of him. 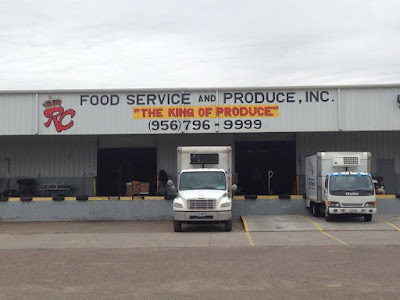 Speaking of Obregon's Restaurant, making the rounds on television is the new commercial from RC Service and Produce located on Market St. If my keen eye serves right, the ad was filmed at Obregon's #2, at the corner of Market and Marcella. Look out for the t.v. spot; it features the Border Bail Bonds character in a tall chef's hat. Plugs aside, let's get back to our own self-loathing. I've cringed once or twice when a clerk has started off our exchange in Spanish. Perhaps it's some form of subconscious nativism that's taken hold of me; something akin to Mr. Harrington-Ramon's overt disdain for Spanish greetings. Perhaps. What bothers me more, I think, about the Spanish hello is that the cashier assumes I speak Spanish, and possibly thinks I'm more Mexican than Laredoan. Okay, so I don't dress in Wranglers and boots and that can give people the impression that I'm not from Laredo. And my skin tone can go between tawny and mocha, depending on how much sun exposure I get. But that's no reason to automatically think that I'm a Spanish-speaking client. Any level-headed person, such as myself, would storm out after such an insult to my identity. But in doing so I would run the risk of my pollo con calabasa plate spilling onto my clothes. Thankfully the soda de manzana helps to calm my nerves. Outrage! Outrage I tell ya! America! The Archie Bunkers of Laredo don't take kindly to all the Mexican culture that's supposedly encroaching on our beloved hamlet. 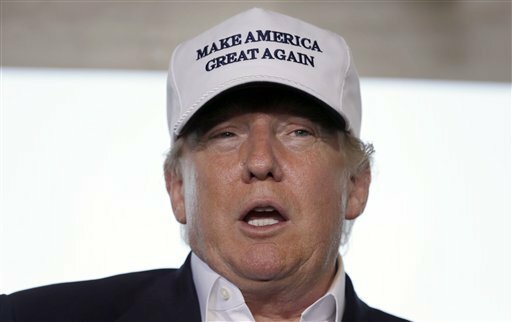 Donald Trump thinks the majority of Mexican immigrants are rapists and murderers. Laredoans have a milder assessment of our neighbors: they're moochers and they speak too much Spanish. People are funny. Laredoans even more so. It was noted last week during Trump's visit that our community was 95 percent Hispanic. 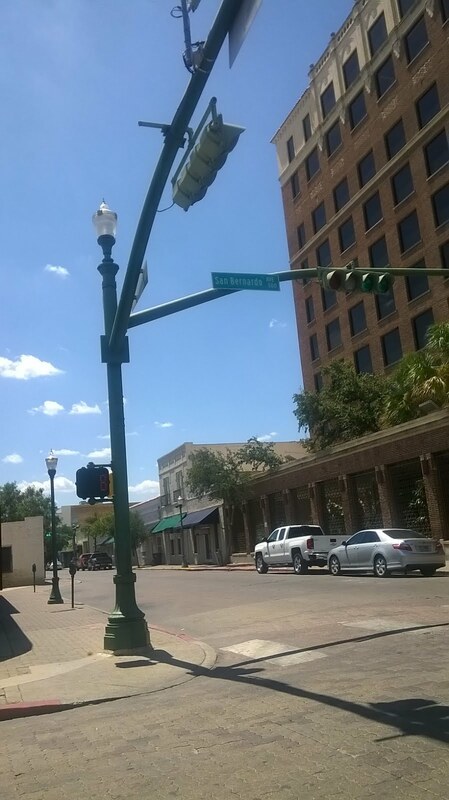 A large portion of Laredo identifies with one religious denomination or another. For a town that is supposedly ultra Christian, there is a lot of hatred going around. The bitching I understand. But it gets to a point where we're, on some level, denying that we're cut from a different cloth. Our nopal might be a little diluted, but it's still a nopal. Patricia Barrera once again graced 8 Country (KGNS) viewers with a television appearance yesterday, this time to unveil her plan of milking Webb County residents of more money. 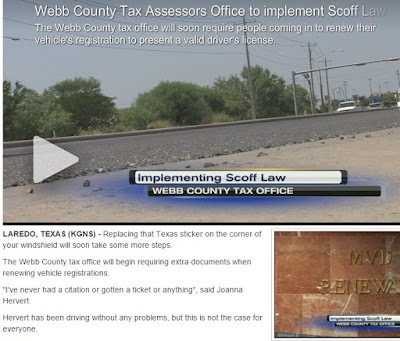 The veteran tax assessor wants to put into effect the Scoff Law [insert eye roll here] program in her office. With it she'll be able to identify any person who has outstanding fines that haven't been paid to the county. This background check will be done when you go to renew your vehicle registration at her office. If you're found to have unpaid tickets or whatnot, then you'll be sent to the appropriate office to square away your debts. For Barrera's troubles, you'll have the honor of forking over $20 in her direction. Once you pay your fines, then you can renew your tags. We can't all be upstanding citizens like Patricia Barrera. For her to tack on another fee to somebody who is facing outstanding fines is just mean-spirited. It's one thing to help the county recoup monies that could help carry out its services. What she is doing is adding insult to injury. It's no secret that I don't like Ms. Barrera. I don't like the way she carries herself. I don't like her so-called faith-based demeanor. And I don't like the way that people give her a pass on her own transgressions just because she supposedly runs an efficient department. Two years ago the county, along with Ms. Barrera, and the state added ten dollars to the vehicle registration fee in Webb County. Now she wants to add another $20 for some individuals. I don't know how I'm going to do it, but it's my new purpose in life to encourage friends and family, and perhaps the whole community, to renew their vehicle registration anywhere besides the local county tax assessor's office. The days of Patricia Barrera strong-arming people have to come to an end. It wasn't so much that we wanted to recoup all our money. 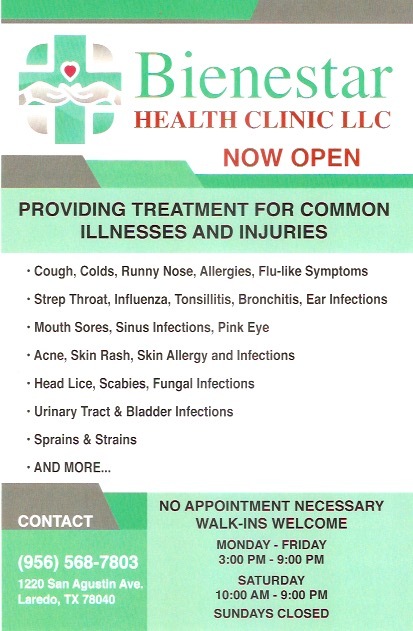 It was more of a service that we wanted to provide. This photo I took because I noticed that the Dept. of Transportation mowed the grass along I-35/San Dario Ave. The Ramada Inn, formerly the Holiday Inn, is in the background. Below is a shot of us going south on Santa Ursula. File these two photos under random thoughts and shots. Our LaredoFOX station touched on the Confederate Flag debate going on in South Carolina, where state officials are looking to remove the banner from the state house for good. 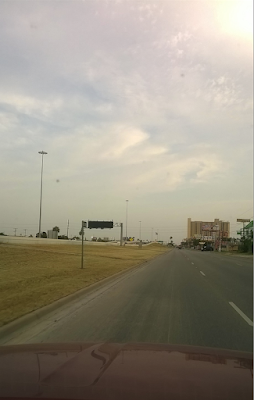 Laredo officials are taking a more casual approach to the matter. 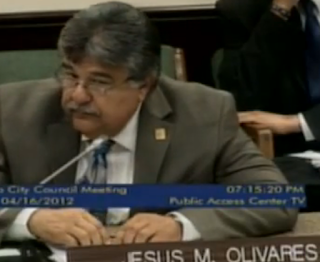 Mayor Saenz: Laredo is a sympathetic city for the most part. 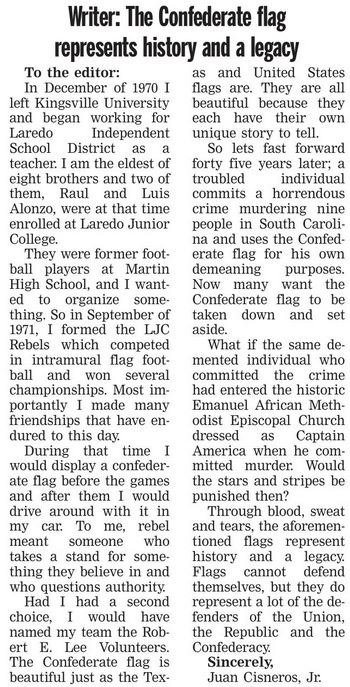 I don't consider Laredo as a racist community; it's very tolerant of people's differences and colors. City Manager Jesus Olivares: Here with the City of Laredo we feel that the flags that are flown over the city are strictly historical and have nothing to do with anything that happens in any other state in the United States. The mayor's last statement is awkward, to say the least, but I won't dwell on it; I don't know if he was just at a loss for words. Moving on. It's interesting that the natives are choosing to cling on to the Confederate Flag, a symbol that has proven to be divisive. But it goes along with our absurd contradictory nature. 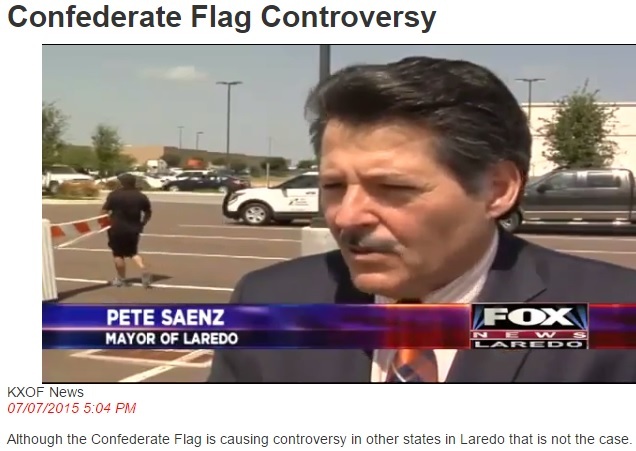 Laredo is 90+ percent Hispanic, but at a drop of a hat we'll criticize anything Mexico. 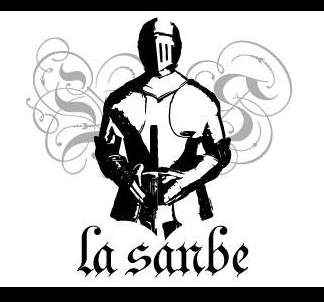 We love to pronounce la-RE-do in Spanish, but we don't give Tomas Sanchez, our town's founder, a thought. Instead our parades give it up for George Washington. We pay tribute to Pocahontas, a lovely female icon with pleasant features, who hooked up with a white man. But what of the Aztecs or Mayans? No, ours is a more sanitized history - one that foregoes the "Gateway to Mexico" slogan in exchange for "Laredo: There's Always A Reason To Celebrate." Gawd forbid we should be associated with our neighbors to the south; They have real problems, ya' know. 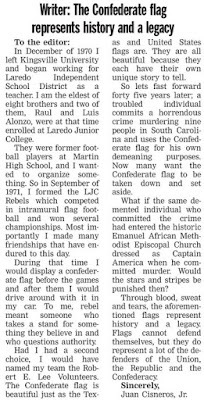 According to Mr. Cisneros, it's more a principled symbolism that dictates our need to co-opt the flag of the Old South. Forget about the brutal history behind the Confederate Flag. The men who died fighting Union forces were standing up [to secede, as traitors, for slavery] to tyranny. It's funny that we're holding steady to defend the legacy of this flag, one that is said to represent states' rights. Apparently, our former brothers and sisters didn't want the federal government telling them how to run things. But now, the likes of Mayor Saenz and the rest of the denizens of city hall bend over backwards in justifying to us their Spring Break jaunts to Washington to plead for federal money. Laredo is a strange place. Our citizenry has been bequeathed a healthy dose of poverty, yet we cheer on our version of Martha Washington: young, fair-skinned role players who may or may not actually live in Laredo, but flaunt gowns worth tens of thousands of dollars. We pervert history so as to amuse ourselves and promote tourism. Mr. Cisneros does the same, whitewashes the past, assigning a more noble characterization to a period that divided the country. Our mayor, meanwhile, thinks there's nothing to see here. Move along. It's goofy the things we pick and choose. Two years ago the St. Peters School mascot name was changed to The Crusaders. For that one, think holy war and post-911. We have an elementary school named after one of the most corrupt politicians south Texas has ever seen, J.C. Martin Jr. We don't have any tributes to Lawrence Berry, or Chaca Ramirez, men who stood up for what was right, but godammit we can show you where Col. Santos Benavides Elementary School is located. Santos Benavides, to refresh the mind, was related to Tomas Sanchez. Benavides is hailed for his years of public service. Oh, and yeah, he was assigned the rank of colonel by the Confederacy. He in return gave the rebels a hand in transporting cotton along our ever-celebrated trade route. But Santos Benavides was a rugged frontiersman who fought off federal forces, all in the name of 956 sovereignty. He's the mold from which we'll draw inspiration. We will defend his honor, and the flag for which he fought for; never mind that he was on the wrong side of history. Primo got paid! We will interpret our legacy. We may, though, have to jump through hoops to explain why we identify with a Lemur. It won't make any sense, but it'll make for an interesting story. What Did Odie Arambula Ever Do To You? Laredo Times resident columnist Odie Arambula continued to chime in about county business in his weekly post. And why wouldn't he? The city council has decided to have only one meeting for the month of July. While we wait for that meeting of the minds, Arambula reminded us yesterday about the current struggle between Commissioner John Galo and County Auditor Leo Flores. 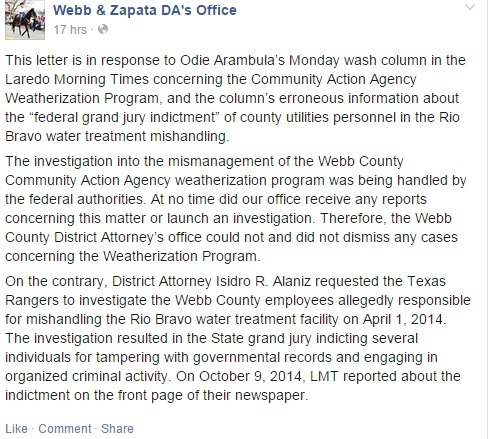 We found it amusing that a federal grand jury indicted a bunch of several county Utilities personnel on the Rio Bravo water plant mess, but we couldn't even get past the DA's door on the Weatherization dismissals or an Open Meeting violations. Mark your calendar; the weekend 4th of July fireworks are over and let's see what's in store for next week. Next week we'll probably have a rebuttal from Mr. Arambula for the succinct message posted on Facebook by the district attorney's office. 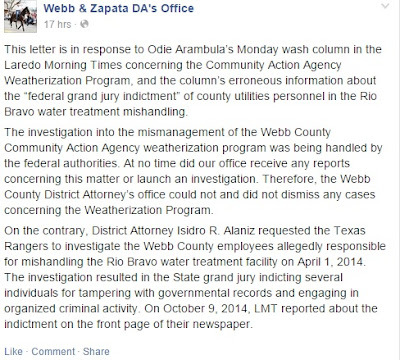 Okay, so the Rio Bravo water plant case was handled by state agencies, not federal. Point: district attorney and his ghost writers. But I think the office of Mr.Isidro Alaniz, and the horse-riding DA himself, misses the point about the disparity of indictments that have been focused in one direction. In the matter of the water plant fiasco, many arrests were made, 8 to be exact. That was last year. On the other hand, people that were laid off by the county have yet to answer for their misdeeds. 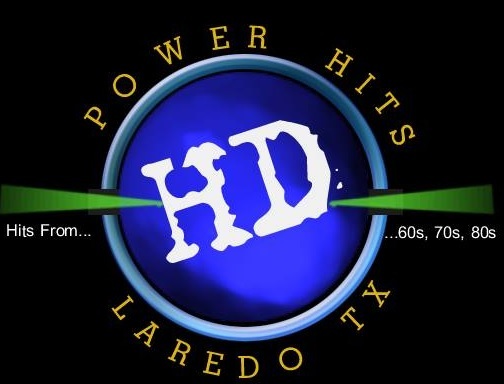 The Laredo Times reported on November 4, 2010 that the weatherization program had been suspended and several employees laid off. I think these are the dismissals that Mr. Arambula was referring to. The state found numerous discrepancies, I repeat, THE STATE, found numerous discrepancies in the weatherization program, but here we are five years later and the county is paying the contractors who (allegedly) did shoddy weatherization work, and a DA who is fretting over semantics. The arrests in the Rio Bravo case have been swift. On the contrary, the only ones who have paid for the weatherization scandal have been the taxpayers. We have squared up with Charlie San Miguel, and now Aaron Ramos (son of Andy Ramos) is looking to get paid for his work. August 2000 Leo Flores re-appointed as auditor by Board of District Judges. January 1, 2013 John Galo sworn in as commissioner. March 8, 2013 County not getting reimbursed grant money from state. Auditor notes shortfall. May 29, 2014 Commissioners and auditor discuss payment to contractors that did work for the weatherization program. Auditor not quick to release check to contractors. August 19, 2014 Leo Flores dumps cold water on John Galo in ALS ice bucket challenge. 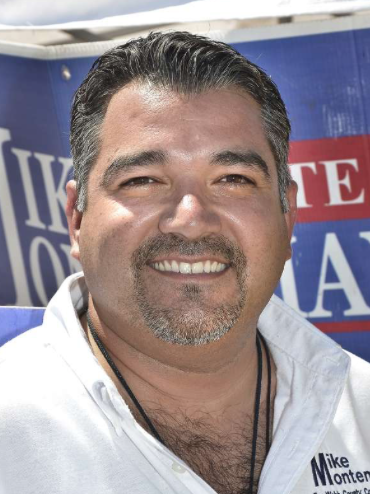 January 12, 2015 Leo Flores re-appointed as auditor by Board of Judges. April 20, 2015 LMT reports that a complaint about the auditor reached the district attorney's office. John Galo views Leo Flores as a threat and liability. May 27, 2015 Commissioners taking steps to replace Auditor Leo Flores. June 22, 2015 Leo Flores ejected from meeting by county judge. 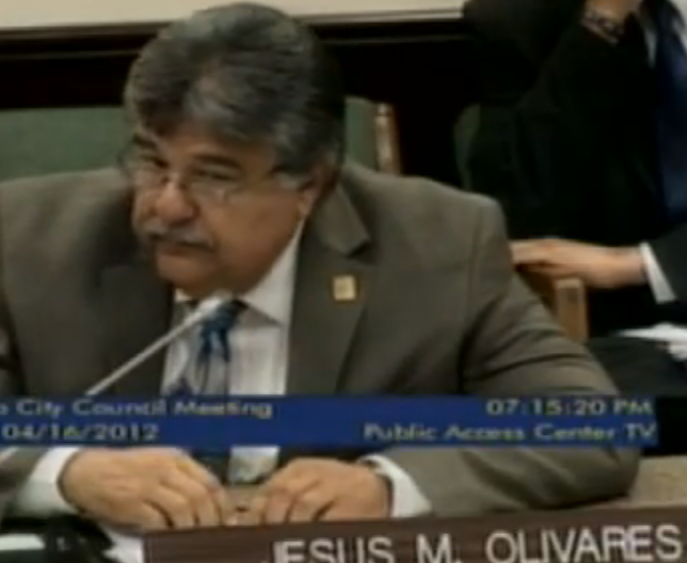 John Galo upset that auditor slipped a purchase into Delia Perales' report. July 1, 2015 Webb County Board of Judges discuss Leo Flores' (auditor) responsibilities. County Judge Tijerina in attendance. July 20, 2015 County Judge Tijerina sends letter to district attorney requesting investigation of county auditor's alleged transactions. 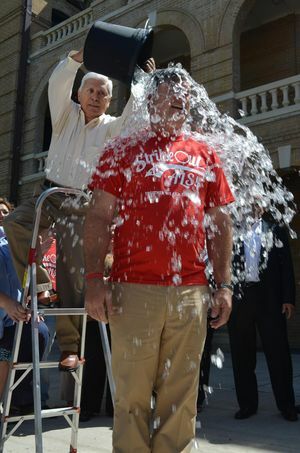 “Garza and the City certainly had a reason to try to prevent us from exposing their wheeling and dealing, which included campaign contributions, gift, jobs, and favors,” stated Richard Geissler, president of VIDA. “Our continuing investigation shows that Garza has profited handsomely to the tune of $813,764 over the past 2 years of his 20 year lease with the City. Yet, the City netted a mere $90,738 during this time period - less than the interest the City has paid on the $2,100,000 in bonds which it sold to finance the construction of the two facilities that it gifted to Garza for 20 years. At this rate, Garza will earn $8,130,000 over the 20 year term of his lease, money which we taxpayers will pay to balance our budget, while the City will not even recoup its construction costs,” added Geissler. VIDA and Dr. Farias prevailed pursuant to Texas’ Anti-SLAPP statute, which protects against lawsuits filed for the purpose of silencing the public’s right to speak freely and to engage their government in the public sphere. 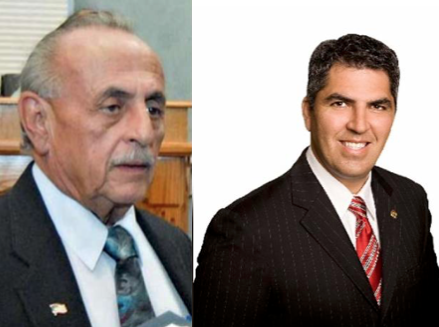 The case is now remanded to the 49th District Court in Laredo for hearings on attorneys fees owed by Garza to VIDA and Dr. Farias, and for the imposition of money sanctions against Garza sufficient to deter him from using lawsuits to limit the exercise of free speech. Laredo attorney Adolfo Campero represented Garza.